In order to understand why coffee stains form the way that they do requires us to think about how liquids behave when they are placed onto a surface. This brief sketch introduces the fundamentals of these effects. When coffee is spilled onto a surface, the liquid will either ‘wet’ the surface or form a droplet (the surface is said to be non-wetted). Very clean glass is ‘wetted’ by water [link] which means that spilled coffee would just spread over a glass surface. It is unlikely that any kitchen glass will be clean to the level needed to see this effect, however for the experiments outlined here, plastic was used as it is more clearly ‘non-wettable’ (the coffee formed drops). When water falls onto a ‘waterproof’ or “hydrophobic” surface, it remains drop-like. 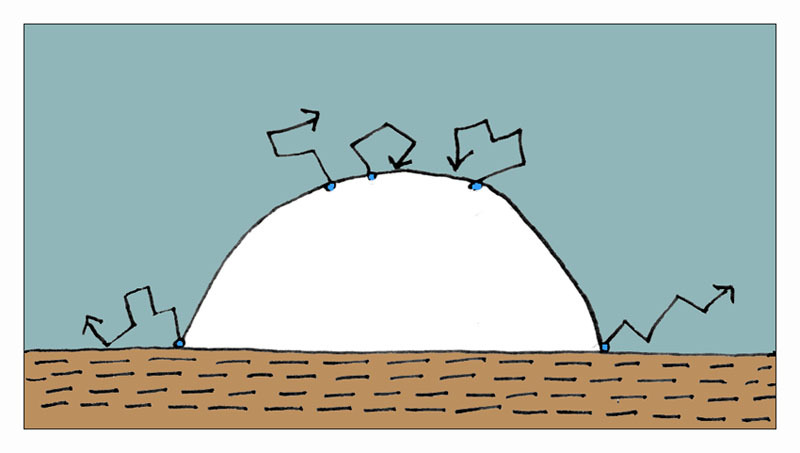 An illustration of a wetted surface and a non-wetted surface is given in the cartoon above. For the coffee stain to show a ring, it is really best to stick to non-wetted surfaces. Once the drop forms on the surface, the edge gets stuck in position, it is what is known as ‘pinned’. 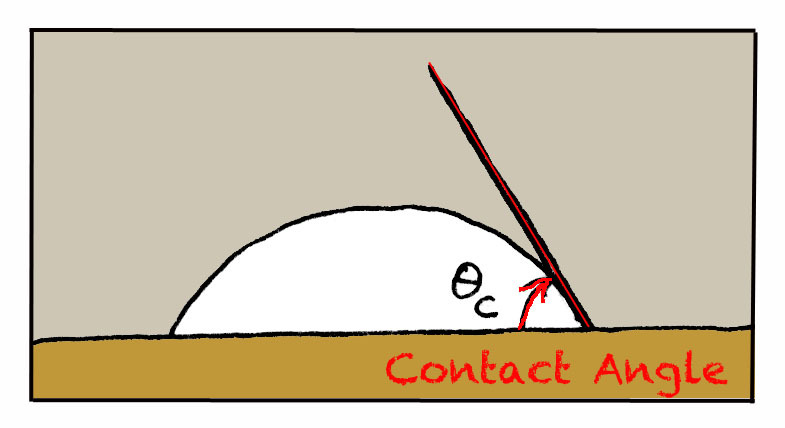 To understand this, we can define the ‘contact angle’ as in the figure below. It is a measure of how ‘wettable’ a surface is and depends on the surface tension of the liquid and whether the surface is ‘hydrophilic’ or ‘hydrophobic’ (waterproof). If a liquid completely wets a surface, it will have a very low contact angle. The surface is said to be more wetted if the contact angle is less than 90 degrees. It is mostly non-wetted if the contact angle is greater than 90 degrees. For any one drop on a waterproof surface, the contact angle can decrease considerably before it is energetically favourable for the drop to move [link]. Incidentally this explains why drops on a surface that gets slowly tilted do not immediately flow down the surface as you may expect if they were just pulled by gravity. The relative flexibility of the contact angle means that once the edge of the drop is defined, it is quite fixed and resistant to movement. It is easier to reduce the contact angle and make the drop flatter than it is to move the drop at all. As with any liquid, the water in the coffee-drop is constantly evaporating from the droplet. The rate at which the drop evaporates is dependent on a number of parameters such as the temperature, the relative humidity, the surrounding air pressure etc. Water molecules evaporating from the droplet do not move in a straight line away from the drop as soon as they evaporate off. Instead they follow a ‘random walk’ pattern, colliding with other molecules in the air and therefore following a very convoluted route as they leave the drop. This means that they could randomly re-enter the droplet. Think about the geometry of the droplet. Is it reasonable that the water molecules at the edge of the drop are more likely to evaporate out of the drop than those at the top (consider the cartoon below)? As the water molecules leave the droplet, they are more likely to escape if they are at the edge than if they are at the top. As water evaporates from the edge of the droplet, the drop could either shrink inwards or become more squashed. As discussed in the section on contact line pinning (above), it is energetically far preferable for the drop to become squashed than it is for it to move. As water evaporates from A, the drop gets flatter. Consequently, the coffee particles flow from A to B forming a ring. As it becomes flatter, water from the top of the drop (at A) has to flow towards the edges of the droplet (around the circumference B). As the water contains the coffee particles in it, these will be carried with the flow so that, for the most part they deposit in a ring at B. If coffee rings do indeed form as suggested above, two drops placed very close to each other may be expected to form some odd coffee rings. As a water molecule evaporates from drop 1 (which sits very close to drop 2) it will have a high probability of being absorbed into drop 2, and vice-versa (see figure below). If two drops are close together as they dry, odd coffee ring patterns may be formed. Hence we may expect to see a coffee ring pattern more like the figure on the right (above). Do we? Although this is the basic explanation for the coffee ring, in experiments I have done so far this ‘two drop’ ring is inconclusive. While preliminary attempts did appear to suggest such rings, attempts to replicate the experiment (such as the photograph below) were less successful. Do the drops need to be placed much closer together than I have managed in recent experiments? Is it very affected by temperature or humidity? Perhaps you need to investigate and share your results with Bean thinking (contact). Are coffee ring edges well defined for close drops? Perhaps you need to try it yourself.